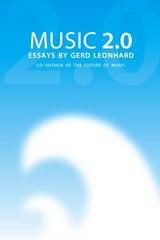 Gerd Leonhard's new book "Music2.0" is now available, finally, both as a 'real', perfect-human-interface i.e. printed product, as well as a pay-what-you want pdf download (i.e. you decide how much or even if you pay). Music2.0 is kind of like a 'best of Gerd Leonhard' compilation, 227 pages filled with the zaniest blog posts and juiciest essays from the past 4 years, slightly remixed and tweaked to perfection, riffing on 'The next Generation of the Music Industry'. The book continues and expands on some of the ideas and models he cooked up in his first book “The Future of Music” (co-written with Dave Kusek), describing what he thinks the next generation of music companies will actually look like, and getting even deeper into some of his favorite buzz-phrases such as Music Like Water and the Flat Rate for Music, Feels Like Free (FLF), the Usator, Friction is Fiction, and the People Formerly Known As Consumers. The book is licensed under Creative Commons Attribution- Noncommercial- Share Alike 3.0 United States License. To get a copy of the book or to retrieve the pdf download link, go to the Music20book.com site. It accepts Paypal (and credit cards, via paypal) and will ship anywhere in the world. I've written about Gerd in the past. Also, read my thoughts on Music 2.0.